"Brand and Issue Management monitoring "
Radarly is the perfect alliance between technology and human analysis. A must have for every communication Director. To my mind, Linkfluence should go further in his consultancy action towards its clients. From Insight cabinet to integrated communication agency ? Radarly gives me the ability to follow closely every sensitive issue mentioning my brand. Allowing me to be in time in responding. I like a lot the Radarly filters that allow you to sort out social media posts based on their author, language, influence, platform or images they bear. These are really powerful features. Today's Radarly doesn't fit well in big screens. Yet, I know it's being fixed. Moreover, tagclouds tend to focus on what is alrealdy looked for through queries. It's really important to take time to define specific queries meeting your real social listening needs. You should also make sure people using Radarly to build reports feel easy enough to make the most it. Finally, don't forget you can go beyond Radarly connecting to Linkfluence's API. I use Radarly to monitor digital communication campaign, especially conversations with influencers. Besides, Radarly's particularly convenient to build reports. Radarly was designed by online reputation experts who have handled social media monitoring for major corporations and media companies (eg McDonalds, ClubMed, France Television..). Their expertise in the monitoring space is evident when one uses Radarly, which is easy to use and appropriate for a variety of use cases. Radarly sports an elegant user interface with a no frills feature set. It has been a pleasure to use their application to monitor conversations for ModCloth across Twitter, Facebook and Instagram. Radarly does not monitor certain social networks that are important for my company such as Pinterest. That said, most of their competitors do not. We have used this product to monitor conversations on networks where ModCloth is highly active such as Facebook, Twitter, and Instagram. Our team has loved using this tool which scales well and is easy to setup. "A sophisticated and complete tool!" I was quite amazed by how sophisticated Radarly can be in terms of design, analytical capacity and arranging or filtering great deals of data. The graphic interface is suitable for client’s community management reports and this saves me a lot of time. I think the automatic feature which classifies the content’s tonality could be better. For elaborated reports concerning the social web whether it includes forums, social media, blogs, websites, the tool is definitely recommended. It provides full-range coverage for any online content available. When you serve several clients at once, the tool can also be useful since everything is fairly organised and it allows you to switch from client to client easily. The benchmarking tool has optimized a significant deal of manual tasks I used to be in charge of before Radarly, but now with a more accurate approach. It also helps having social web listening and user engagement on the same tool. Radarly is an easy-to-use software. It provides users with several customization possibilities without lacking an intuitive and ergonomic interface. As mentioned before, the tool sticks to a very pleasant design, which mostly means you don't necessarily have to be a tech expert to use the software up to its full capacity. While charging large amounts of data, the tool can be a bit time-consuming. In order to make the most out of Radarly’s analysing and listening capacity, I would recommend insisting on elaborating a wise and well-shaped set of queries. It’s the software’s basic key to success, so it’s equally important to serve yourself from all the creativity and expertise provided by Radarly’s tech support team. 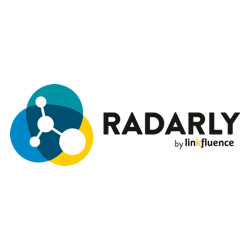 "Social research taken to the next level"
Radarly is great for identifying key influencers and provides detailed insights as to where social conversations are starting and how they are developing across the globe. Allows me to identify and understand key social metrics and provides unrivalled level of detail as to who's talking about brands - and most importantly, what this means. Tool took a little bit of time to set up correctly so that results not too general. This is a stand out product if you want to get a deeper level of insight. It's a level up from some of the other tools out there and their Professional Services offer really helps you get the most out of this. Helping us to research key sectors and markets. As well as providing specific brand intelligence for our clients and competitors. Identify key ambassadors and influencers across sectors. "One single tool for it all." Besides the fact I personally find Radarly very intuitive when it comes to User Experience, the tool proves itself to be just as powerful as it is visually nice. What I like the most is that Radarly offers plenty of different features displayed in a structured way. It’s a very agile software that allows you to figure out the social media approach that best fits your strategy and business objectives. I wish the automatic tonality feature was a little bit more accurate. I usually like to use Radarly to track trends, follow hashtags and always be aware of the upcoming “hot topics”. Before using it, I used to do these tasks manually, based on my intuition. Now, social media monitoring saves me a lot of time and delivers more in-depth results. "Listen to answer : a useful guide for online conversation"
have a single well design dashboard to handle conversations : listen and answer in the very same place. My main regret is that I do not have enough time to analyse deeply the insights from my social box. Large conversations to follow up with , not only on my brand but also on large & complex themes. Radarly give us the ability to listen to the communities, answer them, on a single well designed dashboard. "Powerful and agile - An agency perspective." The ability to lock down key metrics and insights for strategic purposes, in addition to the more operational and daily features. It is therefore a very versatile tool that can be used by community managers, brand strategic leaders and everyone in between. It is easy to extract key learnings that are going to be actionable and convincing at the same time. Although Radarly is on par with other social media business software with respect to UX and UI, it stands (like the whole of the industry's products) to be perfected in respect thereto. It is easy to use but I would say it should be improved still so as to really become pleasant to use. Be sure to spend enough time (on your own or with Radarly's team advice and assistance) on the configuration of your dashboards (especially the choice of keywords to reduce noise and increase meaning). I've had the occasion to use Radarly as the head of the digital / social media department of an advertising agency as well as a global agency strategic / account lead for major brands. Radarly is a very useful tool for social media strategists and practitioners, being transparent and customisable enough to allow for rapid and intuitive interactions with social chatter and activities. From a strategic perspective, it offers to access key insights and metrics to inform strategic decisions, and not only daily operations. Radarly has offered me and my teams to create and turn talking points overnight in some fast paced e-influence campaigns, as well as to inform longer term strategic decisions. "An easy-to-use yet highly sophisticated technology"
Daily user experience with Radarly is really smooth. Radarly makes social media monitoring easy from day 1 of using it. Besides, it is extremely convenient to have analytics and engagement tools on the same platform. Radarly lacks a bit of sexiness. I would love it to be more colorful. Take time to set up an efficient social media query. It should be neither too broad nor too tight to generate maximum value. Use the RSS feature. It makes a big difference! Radarly provides me with relevant pieces of information from all over the social web gathered on a unique dashboard. Beyond data harvesting, I use Radarly to measure social media performance and seize impact of my actions on my publics. "A very effective tool for social media analysis "
Getting started with Radarly is very easy. Radarly is user-friendly : you can painlessly sort social media posts and get social data you need. Besides, the Bookmarklet functionality is a real treat when it gets to handle complex corpuses. Some categorization rules are somewhat rigid. I would like more flexibility. Radarly allows me to deal with huge quantities of information. I use Radarly to monitor brand reputation and manage crisis. Radarly is also convenient for business intelligence. "Pratical and exhaustive tool for social media analysis"
What I prefer is how the tool is simple to use with a clear and modern interface. You can find easily the information you need. As audience rating analyst on television, I have to know what people think of programs. Radarly is a good way to summarize and see quickly the trend to react to a bashing for example. I realized benefits in terms of time because I have everything about what is happening on social media in one tool. "Social media analysis made trustworthy and efficient"
Radarly dashboards are full of intuitive and easy-to-use metrics. Radarly makes possible to combine technology power and human analysis skils, with manual post tagging for instance. Automatic influencer analysis sometimes doesn't match my needs. Take some time to understand how Radarly works. Besides, ask for training to get the most out of it. Radarly provides me with huge amounts of social data I can handle in a unique tool. It makes possible to easily and swiftly spot key issues and key conversations on the entire social web. "My point oview of this good tool : RADARLY"
This Tools is very easy to use rapidly. Each customer have a account manager Who is very available to help us in the deployment. Sometimes, the time when you use the filter, it dépends on the volume of data, it could take times. It's a dynamic firm which are still looking for long term use ! We really don't follow our e-reputation on the web, we didn't know what our Cusumers was saying about somfy and our products. Now we coulf follow it and share it with all countries we need ! Radarly is simple, beautiful and easy to use. Its slick graphic interface makes great reports for management. I wish the mobile app version of the web interface was as complete ! Don't hesitate this is the user-friendly tool you need to sort out your brand from all the noise out there and make the best out of what social media can teach you about yourself! Radarly is completing the huge task of scrawling, analyzing and storing all the social mentions of our brand. After qualification it gives accurate and robust reputation scores. The perfect tool to set social media reputation KPIs and evaluate our content and communication strategies. "Changing way to look at social media"
Using Radarly, I can go deep into the social data and work in real time. I can zoom back and forward on conversations about specific individuals, places or issues. Radarly is marketer-centric: it combines powerful insight mining capabilities and easy-to-use, playful features. I would like for Radarly dashboards to provide better data displays when I'm pitching. It would be great to have at-a-glance social brand images within Radarly. Get support from Linkfluence teams, ask them a lot of questions and get trained by them to make the most of Radarly. I use Radarly to do Real-Time Marketing, it is convenient both for social media analysis and social media engagement. "Finally, a powerful and unique tool to monitor RS"
A team really motivate and available whenever you need them (pitch, clients, tips, data analysis,...)! As a director of development, i need Radarly on pitch with special accounts. It allows me to quickly identify a brand, its competitors, his vision, ... and by that the appropriate response to provide. "One of the best social monitoring solution "
Radarly is a powerfull tool really easy to use. It gives us the possibility to have a look, in every moment of the day, to the social reputation of our brands. You can set up a search really fast, and focus on specific channel according to your needs. I also really appreciate the design of this software, made with a data visualization touch and interactive dashboards. The software is sometimes a little bit slow when u need to analyse a long period of time. The performance measurement of your social channel can also be improve. "A very handy monitoring tool"
I am fond of all metrics I can easily get within Radarly. I like being able to select specific spans of time to work on. I also find great that I can handle and classify social media posts in many different ways. Besides, being able to use Radarly in French makes a big difference! Radarly's influencer features could be improved. I have the feeling they could do better on this point! Make sur your queries are sharp enough to make the most of the tool. I use Radarly on a daily baisis for social media monitoring, to know everything about my brand on the social web. "Radarly : When simplicity meets ergonomics and efficiency"
I think what I like best are the clickable graphs that go in consonance with the different selected settings, such as available sources or categories. That’s what I enjoy the most. As you select, the graphs expand according to choices you made. Influencer management is very exciting too, especially because it’s something you don’t necessarily find in other tools. Besides, Radarly's design and its very easy-to-use interface make it really exciting. The tool can be a little bit slow sometimes. I also think there’s a bit too much of icons on the left side of the screen for the social inbox feature. What I definitely can recommend is to never hesitate on asking for help to the Linkfluence support team since they detain pretty much everything there is to know about Radarly. It’s also relevant to ponder a little bit about queries that will be used even though you can easily change them later; it’s always good to know what you will be looking for from a starting point. We are an agency with a lot of clients. I mostly use Radarly to monitor and analyze daily social media coverage. On a day-to-day basis, I access our client’s accounts and classify the collected coverage into categories and tonalities in order to spot a possible undesirable outcome. I also use Radarly to respond to consumer’s interactions with brands. Then, I notify our Community Management team as well as the client. I can also use Radarly for more punctual requests as an online reputation audit where the tool would allow us to analyze the client’s image instantly. "A rewarding and easy Social Media Analysis experience. " The thing I like the most about Radarly is the possibility of arranging and filtering huge amounts of data through the Social inbox feature. What I enjoy less about Radarly is the Radar feature that sometimes offers a big information flow that can be a little bit overwhelming to work with. To me, it’s rather the very useful capacity of industrializing big amounts of queries and turning accessible a large number of data on a broad period of time. Filtering and arranging results are also part of my everyday use of Radarly. "Radarly: power of research with no equivalent"
Radarly is a very useful tool when doing research on social networks. It offers at the same time anteriority on conversations, a wide scope of networks per se (blogs, forums, twitter, so on) and a first approach at one glance of your results with relevant indicators. I have no idea. I am perfectly satisfied. It provides with an instant access to data and indicators, with no issue of further sourcing. "A powerful, robust and trustworthy tool to spot and analyze consumer trends"
I like for the Radarly interface to make possible to handle millions of data. It is a real, big tank full of business knowledge and information. Besides, Radarly offers valuable data analysis that help you turn social big data into actionable insights leading to added perfomance for clients. The tagging feature could get improved to help market researchers dive further into the complexity of social media conversations. I would appreciate some new filters helping me to refine social media categorization. I use Radarly on a daily basis to roll out approaches that mix market research and competitive intelligence. It helps me understand both consumer behaviors and influencer strategies. Radarly is a hybrid tool meeting many business needs, from crisis management to trend analysis. "A user-friendly and comprehensive solution to manage digital data"
Radarly is an ergonomic and easy-to-use tool that makes possible for us to get connected in real-time to many different, heterogeneous sources. The UX is modern and intuitive. Besides, we save a lot of time thanks to the reporting feature that offer exports in Excel files. At the beginning, I didn’t understand the view showing project volumetry because I found it not really intuitive. Yet, everything became clearer thanks to the explanations of my Account Manager. Our company does linguistic analysis. Therefore, we need online data about specific topics. Through precise queries, Radarly offers a 360° view of all conversations around a specific topic. "Fast, easy to use social intelligence software for data savvy marketers "
Have a trial and see how fast it is and great it looks. "A handy social listening tool"
Overall experience is good. There aren't any particular area I dislike about the product. We are trying to gather feedback from users on different social media platforms about our company in order to adjust our marketing campaign. "Robust tool giving comprehensive listening capabilities"
That you can have different Dashboards so you can specialize your Queries. I mostly use our Social Media Stats Overview for a quick check-up of our Account Performance. We really need to split between post and comments. We use it in the first line for social media Monitoring and web Screening. In the part of web Screening is it very useful where and why our Company is mentioned. The fact you can follow your business or your clients' activity on social media and online newspapers - makes it a remarkable tool and saves you a lot of time. Sometimes it can be complicated to find specific tools and sometimes it lags or bugs, which means you cannot access the website for few hours. However, it happens very rarely. Monitoring problems, keeping all the information and data on one platform. Being able to access data from any period at any time. "Easy to use, not entirely comprehensive"
"great social media listening platform + team"